The Menu Manager is the best way to present menus to your customers in an online manner. A comprehensive solution for static menus, simple or complex menu rotations, single- or multiple-serving-line operations, or any combination of the above… The Menu Manager offers unparalleled flexibility in getting your menu cycle online — and getting it right! The Menu Manager has a webpage interface that can be linked-to on your website. Easy-to-understand calendars and user-friendly selections allow for all menus to show or just one. Or if you wish to embed the Menu Manager in an iframe within a page on your site, the Inline extension can accommodate that. 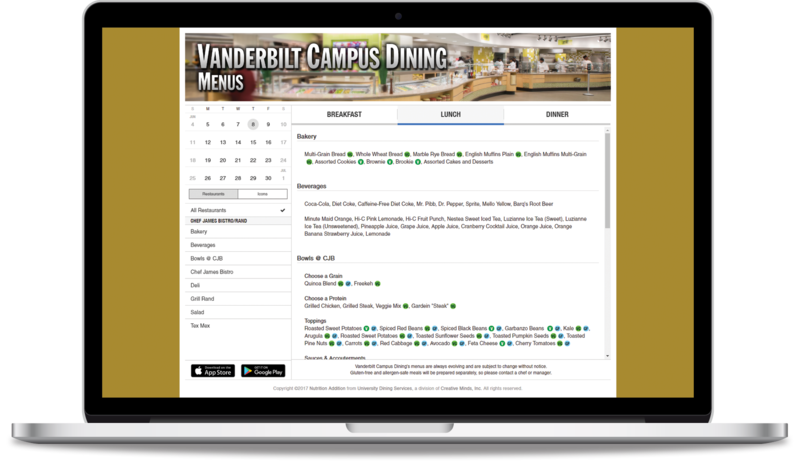 As powerful as the Menu Manager is, it also works with a variety of Nutrition Addition extensions to enhance its capabilities and functionality. Use up to 5 more unique icons. Power digital signage with an RSS feed of menus. Embed the Menu Manager in a page on your website. Visit the Extensions page for more information and individual pricing. Clients that use both the Nutrition Calculator and the Menu Manager have the ability to display nutritional data in the Menu Manager. Accessible in the administrative control panel, menus are configured with a list of foods, and each food can be linked to a food in the Nutrition Calculator. So when you update nutrition information, it updates in the Menu Manager as well. 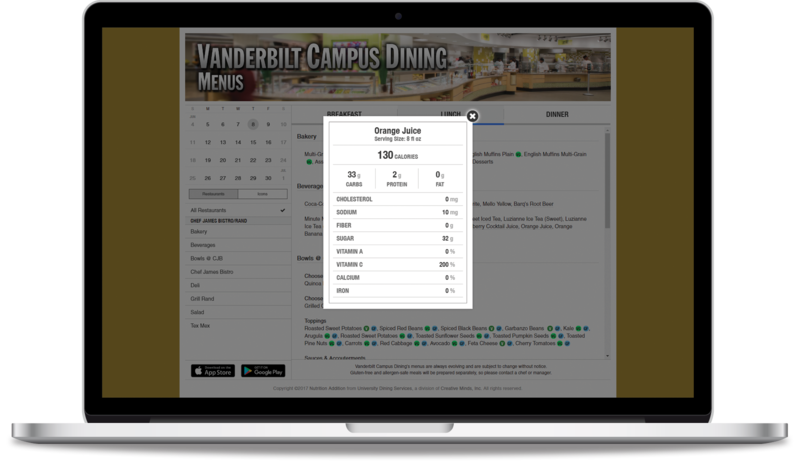 Users with special dietary concerns can easily be accommodated with the Menu Manager. Vegetarian, vegan, gluten-free, organic, kosher, and halal icons are included by default. Icons also denote the eight most-common allergies (milk, egg, peanut, tree nut, fish, shellfish, soy, and wheat). And if you have a special icon you desire to incorporate, that can happen too, whether it’s sugar-free, smart-choice, or a special franchise your program is promoting. Allergy and dietary icons can be customized to any color and any label. For example, if you prefer to say “Made without Gluten” versus “Gluten Free,” that is possible, and you can even use a custom image for any of the icons if you need to say more than the 1- or 2-letter default. The Menu Manager has been developed to be responsive to different screen sizes. Built on the bootstrap mobile-first responsive framework, users of phones and tablets will have as functional an experience as users of desktops. Since the Menu Manager lives on the Nutrition Addition servers, we offer you the ability to customize its appearance. Each client has the ability to choose a custom header graphic and a custom background color to match your own website. Additionally, we offer a “super header” zone where you can prepend design elements that may be integral to your site’s design. Request a demo to see the Menu Manager and the control panel in action! New Nutrition Addition customers will be charged a one-time $500 start-up fee.